The Les Paul 100 is a superb instrument for players looking for an affordable but reliable electric guitar that has the classic look, sound, and feel of a Les Paul. As with all Epiphones, the Les Paul 100 comes with our world famous Limited Lifetime Warranty and Gibson 24/7/365 Customer Service. What are you waiting for? Pick up a Les Paul 100 today and discover the legendary sound of rock and roll! 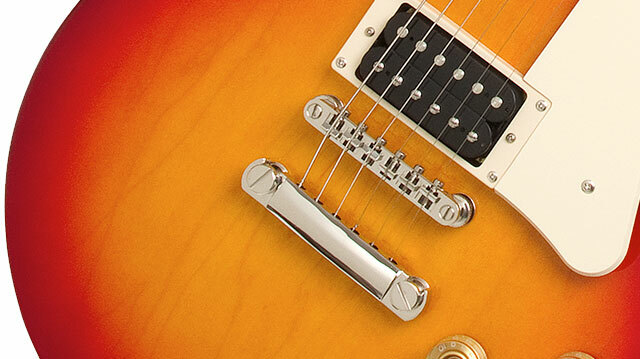 The Les Paul 100 is all you need to get that great Les Paul sound. The all-Mahogany body includes a Maple top which is lighter and slimmer than full size Les Pauls, making it easy to hold for long practices and gigs. The bolt-on Okoume neck features the “Les Paul” classic scale length of 24.75” with a 1.68” nut width and dot inlays. The tone of the Led Paul 100 comes from two Alnico V humbuckers with tone and volume controls for each pickup. 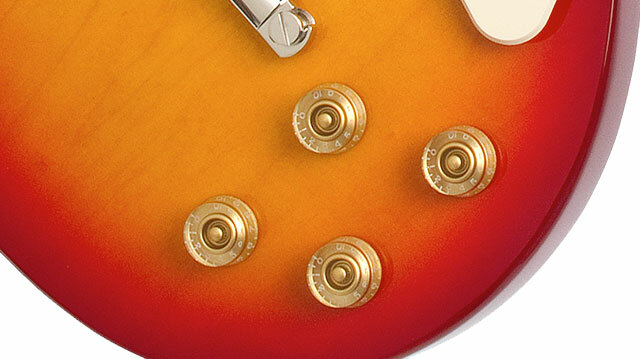 The all-metal hardware includes the output jack and our Tune-o-matic bridge, all made to the same standard of excellence as all other Les Pauls. The Les Paul 100 also comes in four stunning colors including ebony (EB), Heritage Cherry (HS), Sunburst (HS), and Vintage Sunburst (VS).